The Amazon stock price is down over 9% in the first week of trading for 2016, which has coincided with the broader market sell-off. In the same time, the Nasdaq is down 6.55% and the Dow Jones has dropped 5.58%. 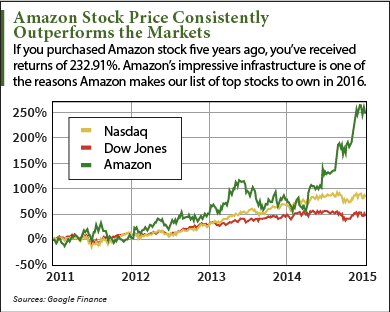 But despite the drop by AMZN, we are still very bullish on the Amazon stock price. Over the last five years, Amazon stock has climbed 230%. In the same time, the Nasdaq is up 76% and the Dow Jones has climbed just 42%. And Money Morning Defense & Tech Specialist Michael A. Robinson credits the vision of CEO Jeff Bezos for turning Amazon into the retail titan it is today. "Analysts thought Amazon.com Inc. (Nasdaq: AMZN) should stick to its knitting as an online store," Robinson stated at the end of December. "But what Bezos knew, and the Wall Street crowd missed, was something called the 'power of scale.'" You see, Amazon was originally just an online book store. But since that time, Bezos has turned Amazon into a retail powerhouse. In July 2015, Amazon surpassed Wal-Mart Stores Inc. (NYSE: WMT) as the world's largest retailer by market value. As of early October 2015, statistic provider DMR reported that 44% of web shoppers go directly to Amazon when they search for a product. Amazon is clearly a leader in the online retail market, which is why AMZN shares have returned 35,647% to investors who first invested in 1997. Growth and innovation are critical for technology companies. Lack of innovation is why the Yahoo! Inc. (Nasdaq: YHOO) stock price is falling and shareholders are seeking for CEO Marissa Mayer to step down. Future innovation, however, isn't a problem for Amazon. Robinson found an emerging market that Bezos is investing in now, and it's a market that research firm IDC predicts will be worth $1.7 trillion by 2020. In October 2015, Amazon established a foothold in the Internet of Everything, also known as IoT. IoT objects like electronics, software, and sensors collect and exchange data. This could allow for future innovation like using a smartwatch to share your location with an autonomous vehicle so that it can pick you up. The Internet of Things is being called the next Industrial Revolution, according to Business Insider. A BI Intelligence report states that over 34 billion devices will be connected to the Internet of Things by 2020. Individual consumers will be able to connect their smartphones, tablets, and smartwatches to the IoT. Amazon IoT is currently in beta testing, but it will allow clients to create cloud-based applications for web-connected devices. For instance, a consumer could receive data from temperature sensors in their home and then remotely adjust the temperature of their home without physically being there. IoT offers plenty of retail opportunities, but governments and businesses will be the largest consumers of IoT solutions. This means that Amazon IoT will receive huge contracts for its services and continually increase its revenue as demand for its services grow. "Bezos has once again broken ground for another multibillion-dollar web business," Robinson told his Strategic Tech Investor readers. Amazon crushed its Q3 2015 earnings report by recording earnings per share (EPS) of $0.17 on revenue of $25.4 billion. Analysts had projected a loss of $0.13 per share on revenue of $24.9 billion. The Bottom Line: Amazon maintains its role as a retail titan and will grow its revenue even more through the Internet of Things. And with the Internet of Things being a $1.7 trillion industry by 2020, the Amazon stock price will continue to reward long-term investors in 2016.